This is an interesting bill from a number of angles. Grover Criswell lists almost a thousand variations of 72 different Confederate notes. * This bill alone has 36 variations. 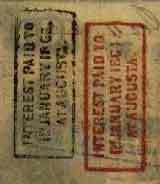 Also of interest is the fact that interest was paid on the note during the war and there are stamps on the back of the note to prove it. In small print at the bottom of the note it reads "With Interest at Two Cents Per Day". That works out to 7.3% interest annually. Not bad rates if you could get the Confederate Treasury to pay. You may notice that interest on this note was only paid to January, 1862. The note has held its value, though. Even today it would probably fetch about $100. The picture at the top center is "slaves weeding cotton"*. On the right is the "Confederacy personified"*. On the left is pro-slavery Senator John C. Calhoun. 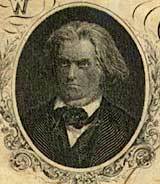 Sumner became the personification of the pro-slavery movement when he caned abolitionist Senator Charles Sumner over the head during a debate on the Senate floor. "More than any man of his time, Calhoun articulated the constitutional, political, and moral assumptions that led the South out of the Union, and the nation into Civil War"**. It might be an interesting note to trot out the next time you are debating the causes of the war. 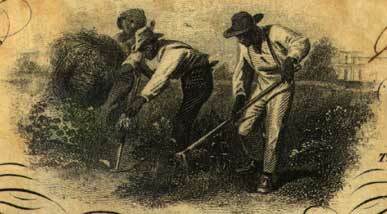 Detail of "Slaves Weeding Cotton"